It was the Tuesday after Thanksgiving and a nip was in the air (at least by Los Angeles standards). Largo's candlelit room provided a warm setting for an appreciative audience to welcome the British-turned-Californian boys of Minibar. The casually dressed quartet eased into their show with two quietly laid-back new tunes that recalled the gentle country rock of their 2001 debut Road Movies. 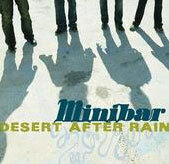 But when Tim Walker switched from pedal steel to electric guitar for their irresistible cover of Ryan Adams' "Choked Up", Minibar started displaying a more aggressive style that their disc only hinted at. While the album sometimes got a little soft around the edges, the band's rockier live performance created more energized music. Walker's forceful but never overpowering guitar work provided an appealing sonic upgrade to album tracks such as "Visible From Space" and "So Long Soho". The band split their fourteen-song set evenly between old and new material. Standing out among the newer numbers were the sarcastic "Thanks" (a tune lead singer Simon Petty introduced as offering "a little bit of gratitude to the Universal family," the band's former label) and the chimey-riffed, slightly Beatlesque "Somebody Down Here Loves [You]". The latter song also featured one of the group's charming attributes: relaxed but tight harmonies, led by Petty's husky, honeyed vocals. Minibar's pleasing combination of easygoing twang and vigorous pop-rock suggests a blending of Peter Bruntnell and Crowded House, which is somewhat ironic considering how American they sound. Sitting in with the band was Wallflowers multi-instrumentalist Ben Peeler, whose additions on banjo, mandolin and dobro enhanced the group's country accents. The night's special guest turned out to be Gram Parsons' daughter Polly, who came out of the audience to harmonize on a sweetly sung cover of her father's "$1000 Wedding". Minibar concluded their hourlong set with rousing renditions of the Road Movies tracks "Six Foot" and "Retrospect", and then topped off the night with the audience-requested encore of their should-have-been-a-hit "Holiday From Myself" - a fitting conclusion to this post-holiday show. © 2002, No Depression, Inc.